The campers had a lot of fun this year. Here are pictures of the five groups. Campers got to custom color safety goggles that they used later in the week. They grew crystals and made octahedral models that showed their basic shape. 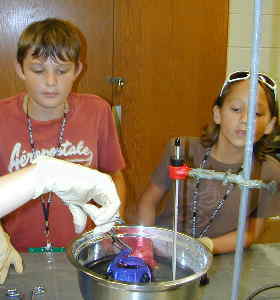 Construction of a conductivity tester and then using it to check various liquids was another of their chemistry projects. The study of bubbleology is always fun (and messy). 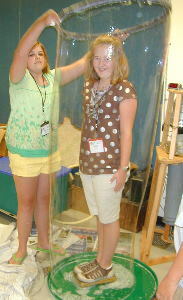 They made giant bubble makers using 2 straws and a loop of cotton cord. Now you can study some of the properties. Can you put things through the bubble without breaking it. What happens when two bubble films touch. Blowing bubbles on a plate lets you see the shape of the interface between two bubbles. The pressure in the smaller bubble is always greater than in the larger ones so the film between always curves into the bigger bubble. 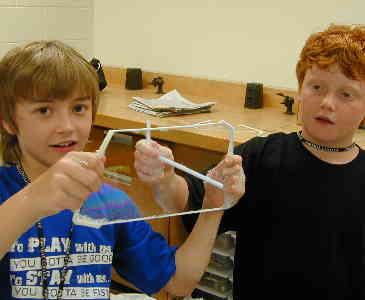 Using the string and straws you can make surprisingly big bubbles. With care and soapy hands you can catch them and study the colors. 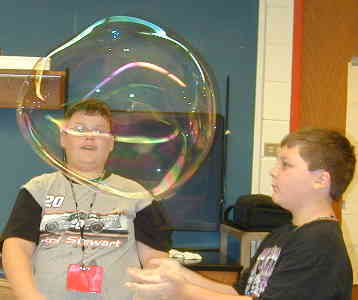 The thickness of the bubble film causes different colors to be reflected. The thinnest films are colorless and only about one millionth of an inch thick. 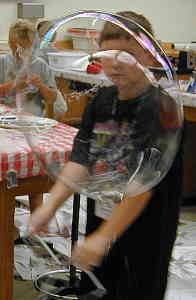 Putting a kid in a bubble brings smiles. The helpers tried it as both operator and subject. It takes quite a while to make a hot air balloon out of tissue paper. Trace the outline, cut the gores, glue them together, inspect the result and test for any holes. We will fly the balloons during the physics olympics on Thursday. In the astronomy class they made flip books showing the progression of the moon's phases. They also built models of spacecraft. 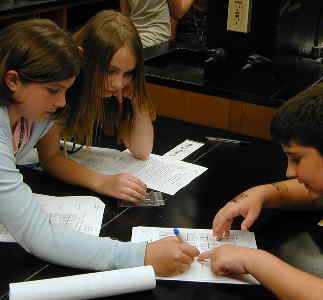 They modeled an ecological system to investigate the interactions. And dissected a dogfish shark. Clearly there were a variety of reactions. In the computer class they learned to program using a storytelling language. A series of competitions were held on Thursday. There was a contest to build a platform to catch a steel ball dropped from various heights. The best catcher would combine the lightest weight, shortest height and still catch the ball without breaking. Some of the entries and a test in progress. Teams competed in several events. The teams that compiled the highest total score won prizes and the admiration of all concerned. Challenges included trying to figure out what shape was in a closed box by tipping it and seeing how it moved. 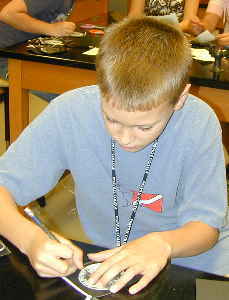 The teams maneuvered a figure through a computer maze, built bridges with toothpicks to be tested to destruction. They also made aluminum foil boats the were loaded with marbles until they sank. Paper airplanes, towers, and a water balloon target shoot rounded out the events. The "Who Wants to be Millionaire" game tested science knowledge. Now it was time to fly those balloons we made earlier in the week. A propane burner provided the heat for liftoff. Trees can be a problem but most were successfully recovered. A few however met a fiery end when a gust of wind blew them into the burner. This year we went to Bays Mountain park in Tennessee. Some of the wildlife we saw there. This fawn was just lying near one of the trails and was not in an enclosure of any kind. The park was home to a pack of wolves. They were kept in a large fenced compound. We enjoyed two naturalist programs. The first was about the wolves and a comparison of their skulls with other large carnivores. A program about birds gave us the opportunity to see them up close and find out about various specializations they exhibit. As a bonus we found this praying mantis egg case that was in the process of hatching.